Since the 1990s, Tania Bruguera has exhibited widely, making performances, staging interventions, and creating installations that destabilize received notions of power. Perhaps her most recognizable work is her performance “The Burden of Guilt” (1997-1999), in which the artist, wearing a raw-lamb carcass, eats dirt with her hands; the performance, we later learned, was a re-enactment of a colonial legend in Cuba, a suicide attempt; a legend of an indigenous act of resistance against the Spanish. In the last decade, the protagonist role that the artist’s body had in her earlier work, disappeared almost entirely. In her placement, Tania Bruguera has engaged actors, and more usually invited the general public to perform. In one of a series of artworks titled “Tatlin’s Whisper,” Bruguera hired two policemen on horseback with expertise in controlling riots to choreograph the course of the museum’s audience. That performance was presented in 2008 at the Tate Modern’s Turbine Hall, as part of the two-day exhibition The Living Currency (La Monnaie Vivante) curated by Pierre Bal Blanc. In another work in the series “Tatlin’s Whisper,” the public could use the microphone to exercise a minute of free-speech. This latter work was staged in 2009 at the Centro Wilfredo Lam in Havana. I should add: authorities were not exactly pleased. As part of an expanded artistic practice, Tania Bruguera has taught and lectured internationally, and in her native Cuba created an itinerant art school called Catedra Arte de Conducta. This school, which she begun in 2002 and concluded in 2009, created dialogues between local artists and visiting architects, theorists and other creative professionals in order to envision and discuss ways in which art contributes to society. Through courses for performance and time-based art, a new generation of artists could and would be encouraged to work politically with their social reality. This year, Tania Bruguera has come to live in New York City to initiate another of these kinds of projects. Initiated by the Queens Museum and Creative Time, this new, long-term art project by Tania Bruguera is called “Immigrant Movement International” and emerges from her long-standing inquiry on ‘useful art’. One of the artist’s main supporters, the art critic Claire Bishop, has explained Tania’s idea on useful art as a “conjunction of political action and illegality … pushing the boundaries of what authority recognizes acceptable”. To what extent and for who will the “Immigrant Movement International” be useful? Well, I suppose this we will learn in the coming months, possibly over the next couple of years. I am confident, though, that this project will at the very least remind us of the role of the modern public museum, which is to cultivate its audience with the aim of creating civic responsibility; of building more informed and creative audience, a more productive and sensible citizen. This responsibility is one that a handful of contemporary artists, including Tania Bruguera, have been taking on to themselves. The image above is of the headquarters of the Immigrant Movement International in Corona, Queens in New York, which I visited yesterday afternoon. Events take place daily. Consult the website for more details and a calendar of programs: http://immigrant-movement.us. What it was. What it is. One of the strongest exhibitions I saw in 2008 was From One Revolution to Another, presented during the fall and winter at the Palais de Tokyo in Paris. The exhibition was part of the institution’s Carte Blanche initiative, whereby an artist is given time slot in the schedule to curate an exhibition in the entire venue. From One Revolution to Another was Jeremy Deller’s carte blanche. The exhibition took the entire venue, and consisted of large and small shows and salons, including the eclectic “Folk Archive” made together with his collaborator Alan Kane. One of my favorite components was “1984-2008. Ed Hall. Banners” (installation view pictured here). These were dozens of banners hung through two—the most spacious—galleries of the Palais. 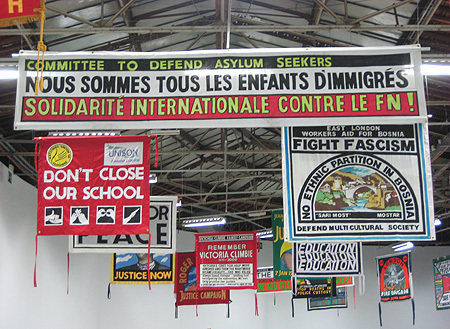 These were beautiful and attractive banners that artist and activist Ed Hall created for “organizations committed to social and political causes.” Hall selected the banners on display, which are on loan by their respective groups represented, and also made a banner for the Palais exhibition. If this was one of the strongest exhibitions in my mind, the reason was proportion. And I do not mean the size of the venue or the scale of the work — two much-heard criticisms about recent exhibitions at the Palais. By proportions I mean to point to the social dimensions that the project embraced. The exhibitions that made From One Revolution to Another presented recent movements, from craft to politics, that create new communities and shape the cultural landscape of Britain and other nations. This year, Deller got his carte blanche in the US for which he creates It is what it is: Conversations about Iraq, co-commissioned and presented by the New Museum and Creative Time. The project starts next month with programming in New York, and then extends nationwide as a cross-country tour. It’s curated by Laura Hoptman, Amy Mackie and Nato Thompson, with research by Shane Brennan, Sarah Demeuse, Ozge Ersoy, Jazmin Garcia, and Terri C. Smith. Organized by Creative Time, Democracy in America is a national-based project investigating democratic tradition in the United States. This year-long umbrella project, curated by Nato Thompson, has several components, among them, a series of national art commissions, some of which were co-coordinated with host institutions, and a New York City convergence center and exhibition. At the invitation of Nato, I curated an international chapter for “Convergence Center” (September 21-27), the project’s umbrella exhibition, which takes place The Park Avenue Armory in New York. This so-called chapter, Foreign Correspondents, approaches the notion of democracy in America from abroad. It includes artworks by four artists: Erick Beltran (Mexico City/Barcelona), Chu Yun (Beijing), Luca Frei (Malmo), and Magdalena Jitrik (Buenos Aires). The artists contribute works about positions associated to democratic ideals, struggles or sensibilities that have been ultimately put into question. With an emphasis on succinct text-based works, and how these work as image or create an environment, the selected artworks also bring into consideration the relationship between art and propaganda. Using the space of a banner and leaflet associated to protest as well as promotion, artists Beltran and Jitrik use these forms to re-inscribe a haunting sense of history and present. Beltran prints a blue leaflet in a run of more than 100,000 copies that read “Fear,” which will be dispersed throughout the entire exhibition, carpeting the floors of the venue. More than a word a feeling that is tactically generated to the current state of exception in the US, which not coincidently begins again taking force after the events of September 11, 2001. Jitrik paints a monumental banner featuring a group portrait of the nineteenth century Native American leader Red Cloud with his peers. I posted an image of the work-in-progress, and briefly wrote about it here some days ago. In different ways, artists Frei and Chu make use of source text now turned historical reference. Frei cites a line drawn from the published letters of the anarchist Nicola Sacco to his son, “In the play of happiness, don’t you use it all for yourself only” (pictured above). Sacco, an Italian who immigrated to the US as a teenager, was tried and executed in Massachusetts in the 1920s. Chu recites a mandatory speech in school about the life story of a heroic Chinese soldier. The recording is originally from 1984, when the artist was a child, and is appropriated by the artist as if were a readymade. Named after the year of its original recording, Chu calls attention to George Orwell’s novel of the same title about an imaginary totalitarian regime. I will be posting images of these artworks and installation views of the exhibition. If you are in New York during that week, please visit the exhibition. Your comments, much appreciated. The sketch above is an artwork in progress by Argentine visual artist Magdalena Jitrik, who is known for her mostly-abstract paintings on canvas and her collective work as part of the Taller Popular de Serigrafía (a.k.a. TPS). This new work combines Magdalena’s interest in social and political history, explored through her paintings, and in the medium of propaganda that was actively taken up by TPS—which, in turn, is part of a longer history intertwining political activism and graphic arts in Latin America (TPS’s name is taken from the early twentieth century Taller de Gráfica Popular in Mexico). Magdalena is one of four artists that I’ve selected for “Convergence Center,” an event-based, week-long exhibition that is part of the larger project Democracy in America: The National Campaign organized by Creative Time in New York. 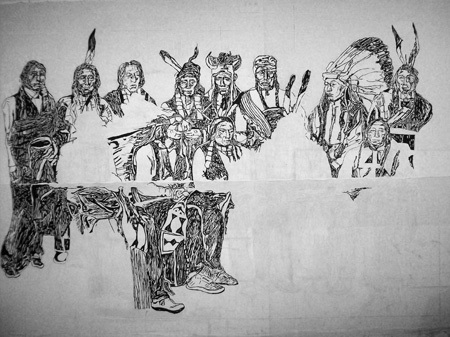 Her new work about Red Cloud, sketched above, will be a painting on canvas (118 x 117 inches), which will be hung as a banner between the entrance columns of the Armory Regiment Building in New York. 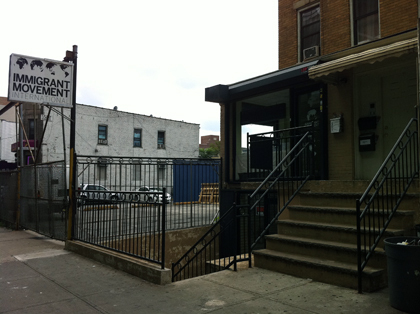 This is where “Convergence Center” will take place from September 21-27, 2008. Aside from Magdalena, the three other artists in Foreign Correspondents, the international component of “Convergence Center,” are Erick Beltran (Mexico City/Barcelona), Luca Frei (Malmo) and Chu Yun (Beijing). I will also introduce their work here shortly.